Osborne’s 8 July budget will be forced through in the teeth of all economic experience. 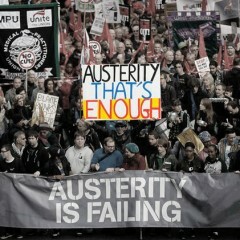 The history of the last 70 years demonstrates one conclusion irrefutably: austerity is the wrong way to cut deficits. After the second world war had dramatically drained Britain’s wealth and left the country with colossal debts amounting to 260% of GDP, these huge deficits were easily tamed by fast economic growth in the post-war years. President Clinton achieved a similar turnaround in the US after he inherited an enormous deficit in 1992 and ended his 8-year presidency with none, largely due to rapid economic growth. Again, the Swedish high budget deficit was successfully brought down during 1994-8 by a policy of fairly fast economic growth. Even in the US in recent years, despite the political deadlock and a largely non-functional Congress, the US has achieved a far bigger and faster recovery from recession than Europe, again as a result of the priority given to growth by Obama. What is striking about these previous periods of large deficits is that debt was not a significant political issue. The public were not scared by the size of the public debt. For every year between the mid-1940s and the mid-1960s the debt was far, far higher than at any time since 2008, during which time it hasn’t peaked beyond 80% of GDP. Yet there was no panic, indeed it was a time of huge confidence as the foundations of the Welfare State were being laid. Had the British public been as acutely frightened by their leaders about the debt ration in the post-war period as they are being panicked now by Osborne, the welfare state, the inspiration not only of Europe but of the whole world from China and Singapore to Brazil and Mexico, would never have been born. So why the vastly different reaction to public debt in those previous times compared with today? The answer is that Osborne has been skillful at framing an (untrue) narrative to suit his political purposes while Labour has utterly failed to offer a (true) counter-narrative to Osborne’s fetish with austerity. Osborne has successfully manipulated the issue of austerity to provide the excuse to achieve his real aim of shrinking the State, squeezing the public sector and privatising almost all public assets. Labour on the other hand has been all over the place between the Blaitite rump who largely support Osborne, a shadow chancellor who never stamped his mark on a credible alternative policy, and a Left whose calls for growth were ostentatiously ignored. Labour now desperately needs one central theme: Austerity won’t cut the deficit, but growth will. According to the Modern Monetary Theorists, the word deficit is a misnomer, as a deficit is really the injection of real asset money into the economy, money that no one can do without. The only thing that can reduce a deficit is having a positive balance of trade with other countries, as a current account surplus is the only other source of real assets. Cutting government injections of real money into the economy while encouraging the help to buy bubble will lead to a financial crisis. If it was not for the fact that this will lead to much suffering for the unemployed, the poor and the young house purchaser it would be a comedy to see George Osborne preside over the next crisis after his blind criticism of Labour. The bare minimum that can happen is another deep recession. It is shocking that there are so many incompetent cabinet (and shadow cabinet ministers who follow this failed doctrine, and have no understanding that a sovereign government can never run out of money, can never default, and can spend money on whatever is for sale, and create full employment. Well, I have a science an Maths background. MMT hold no difficulty for me, and is in fact routed in Keynesianism. Keynes was a mathematician before he was an economist – first class honours. That is why his grasp was so superior, I believe. If you want a better explanation of macro economics from the MMT post Keynesians try reading Bill Mitchells BillyBlog, or James Galbraith, Randal Wray, Stephanie Kelton, Michael Hudson, Steve Keen. Your nonsense about blind faith is blind faith itself. You have done the unscientific thing – you have made an instant unjustified judgement without doing any research. This is what millions of people do, and it is the reason we cannot get rid of neoliberalism. We refuse to look at the alternative. Sandra: Thank you for putting so succinctly. The deficit as described by so called political modernisers is the difference between the tax raised and the money needed for public expenditure. So the question for all those that talk in terms of balancing budgets is, why have they over the last forty years pursued income reductions? The obvious conclusion is that tax reductions have been used as a means to dismantle the state and have no economic benefit at all. Neo-Liberal dogma is driving the world economy, which is why we are in a continual spiral downwards and a depression that won’t go away. Please read the references I gave above. Deficits are often a good thing, as government debt is the real assets of the private sector – household and businesses. Balancing books is not necessary for sovereign issuers of currency, government is such and can never run out of money or fail to pay its debts. It only needs to make sure it spends the money wisely in job creation, research etc, to avoid inflation. Lack f government spending forces people onto private debt (banks create money as debt), and this is the cause of financial crises, when it gets out of control, ie grows to large for the economy to pay. Thank you Sandra, I did understand that, but perhaps didn’t put my point over clearly enough. I fully support MMT and believe we need to Nationalise the Banks and spend money directly into the economy to pay for our public services, create real jobs, research, address environmental issues and investment, nationalise the railways, and utilities. The private sector are sittings on mountains of cash that they won’t use to create jobs because their sole interest is in profit for themselves. We need a totally new perspective based the successful post war Labour government, but with the understanding today, that we don’t have to borrow a penny from anyone or anywhere to do it. We have the money, the only limits to our economic goals are, the human and natural resources to achieve it. We owed 260% of GDP – that is debt, not deficit. Deficit is the gap between what there is to spend, and what is spent. Not the same thing, although there is a direct proportionality to it. You can pay down a debt (which may or may not feed into current deficit, depending on how you handle the accounting) but one can only act on a current gap – reducing a deficit, or even increasing, need not actually affect net National Debt. The words deficit and debt are NOT interchangeable. I seem to recall the National Debt being a political hard ball periodically since before the defeat of Napoleon, but ‘deficit’ spending for govt is, for the most part, business as usual. Even in years where there has been a surplus (negative deficit) the National Debt has not been reduced in any significant way, although the there has been the occasional Bond buy back, which more debt shuffling than it is actual debt reduction.